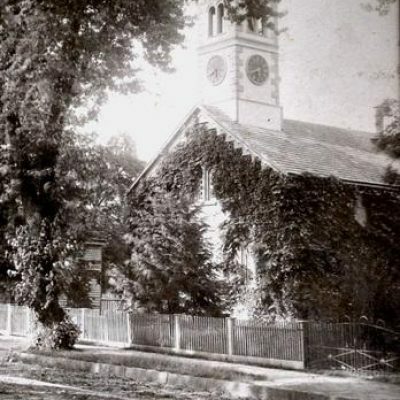 Episcopalians began to worship in Mullica Hill around 1790. These services of Morning and Evening Prayer from The Book of Common Prayer were led by Col. Joseph Chatham, a layman, and held at the grist mill (demolished in 1867). 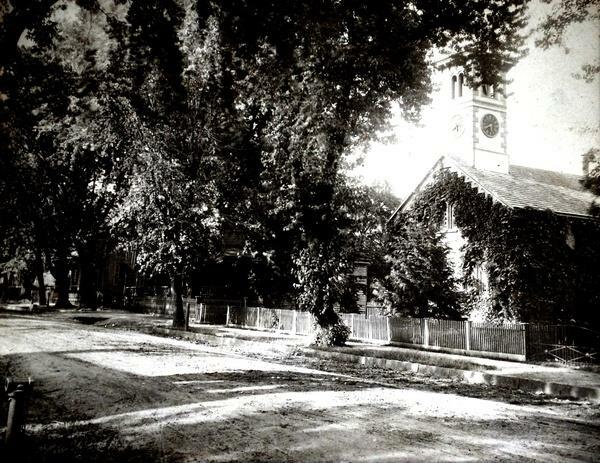 In 1811, as membership increased, three acres on the northeast corner of South Main Street and Church Street were purchased for one dollar from Christopher Knisell, who had owned the mill. There, a small frame structure, with galleries on three sides and the central “three-decker” pulpit of that period, was erected two years later. After Mr. Tanser’s untimely death in 1845, vestry member William S. Mallet took it upon himself to travel weekly to Philadelphia and secure supply clergy who would then spend the weekend as his guests. 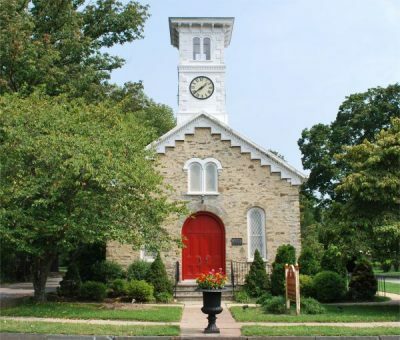 The vestry felt strongly that the time had come for the congregation to move out of the original building and because the house on North Main Street, formerly occupied by the Groff family, had been acquired as a parsonage for Mr. Tanser, the adjacent half acre of land was purchased for $200 from Aaron and Anna Pancoast as the site for the new church. The style of the new building was described as “Italian Country” or “Vernacular Romanesque”. Curiously, the stone used was not local, but shipped from a quarry in Pennsylvania by barge to Mantua and then carted to the site. The noteworthy diamond pane windows are believed to have·been made in Glassboro and the chancel panels (now used for the altar rail) cast at the Mullica Hill foundry, which had a reputation for its decorative ironwork. In keeping with the custom of the day, all the bodies which had been buried in the old churchyard were exhumed and relocated to the new one. It was remarked at the time that many were in well-preserved condition. The cornerstone was laid on April 1, 1852 and the completed edifice consecrated on August 30th, 1853. An embarrassment in the midst of this triumph, however, was that the $5,000 construction cost of the new church proved so great that, even after the sale of the old property, the parish was still unable to meet the expense and it was necessary to sell the parsonage for $1,000 to cover the debt. A touching link with the congregation’s origin came when a bell tower was added in the style of the building. The first person to ring the bell on Thursday, September 11th, 1879, was Mr. Joseph A. Chatham, grandson of the man who had officiated at those first services. The following year, the clock mechanism was installed as the result of a community appeal raising money from local residents of all denominations, making it the “town clock”. 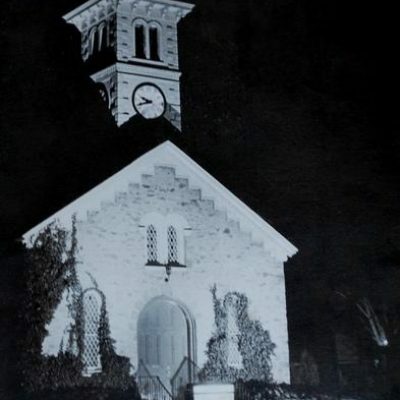 By 1885, St. Stephen’s had declined (the town had lost 45% of its population in the previous decade) and was linked, as a mission, with St. Barnabas’, Mantua. Assigned to the churches was the Reverend Henry Bell Bryan, who immediately undertook a major renovation in keeping with “Oxford” or “High Church” principles. The chancel panels were reconfigured from wall to wall into a three sided sanctuary around a new altar (still in use) which he gave, in memory of his father, to replace the old communion table. A stained glass window depicting the sacraments of Baptism and Eucharist was installed. The organ was moved from the balcony and placed on the south side of the chancel with the choir facing on the north side. Over the years, the membership of the parish, never great, rose and fell. From 1932-1938; no priest was assigned and services were held sporadically. Clergy served St. Stephen’s in addition to other churches. During the Depression, the antique chandeliers were acquired from a closing auto dealership. In 1958, the former parsonage, was willed back to the parish by Mr. Stacy Pancoast. With no priest to occupy the house, however, it was rented out to tenants. More renovations took place between 1960 and 1970. A new pulpit, lectern, and altar canopy were added. Both the chancel and sanctuary were expanded, the choir stalls and two rows of pews were removed, and additional altar rail panels cast from aluminum for the new space. The longest incumbency in St. Stephen’s history began in October, 1967, when Mr. Harry Collins, a seminarian, was appointed as Bishop’s Man-in-Charge, then, upon his ordination, as Vicar. Living in the parsonage, the first resident priest in over a century, Father Collins did not serve any other church, but was employed as a teacher at Clearview High School. He remained at St. Stephen’s until his retirement in 2004. It was under Father Collins that the parish hall, later named in his honour, was built in 1974 thanks to a loan from St. John’s, Salem, which covered over 80% of the construction costs. Heraldic banners of St. Stephen and St. Thomas were given in 1988 in memory of Thomas Lippincott, a noted parishioner. 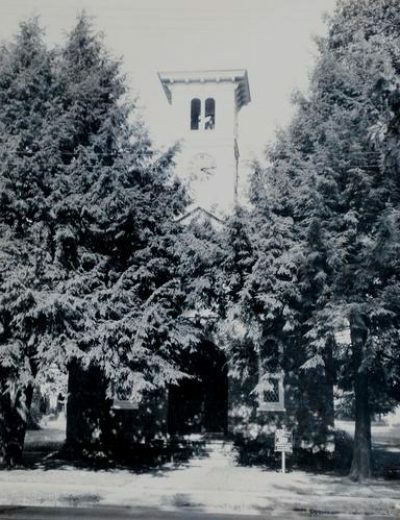 By the late 1990’s, the condition of the tower had deteriorated and the bell was relocated to the garden by the parish hall where it still rings the hours.